With the holidays over, students and families across America have headed back to work or back to school for spring semester. However, with the spring semester comes spring break, which means many people are starting their planning now to escape from their routines and get away for a while. If you are in college and are looking for something new this spring instead of heading to the beach, then a chartered deep sea fishing trip might be what you’re looking for. The Triple Trouble offers numerous types of fishing trips for anyone looking to have some fun on the water. They offer trolling excursions, which is not only a great way to catch big game fish, but a perfect way to fish with friends. While out on the boat, deckhands will set the lines so everyone in your group will have the opportunity to bring home a trophy. When all lines are out, Capt. Chad will take you through the fishing area in the hopes of getting you and your friends that big catch. We also offer bottom fishing trips, which is the opposite of trolling. Everyone on the boat can drop a line, but each line has a weight at the bottom to keep it stationary. These lures work well at enticing fish that live closer to the artificial reefs that you’ll be fishing, and can expect to find triggerfish, red snapper, grouper, vermillion snapper and occasionally a cobia. 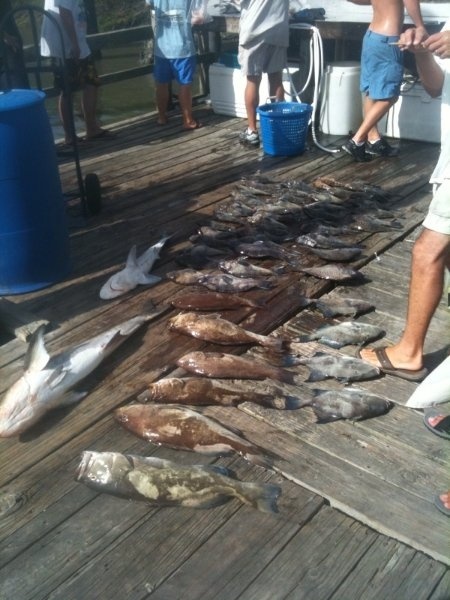 Whichever option you choose, you also have the benefit of enjoying your deep sea fishing in Orange Beach. A warm and welcoming environment on shore offers you plenty of local entertainment during the evenings; while your time on the boat gives you time to enjoy the surf, spray and sun of the open ocean. Take in all the things that make spring break such a fun and relaxing time while still doing something new and fun with a deep sea charter. It’s also a great way to spend some alone time with close friends or family, and an excellent way to create memories that will last forever. The Triple Trouble is a luxurious fishing boat offering deep sea fishing in Orange Beach, Alabama. To learn more or to book your trip, call us today at 256-341-5767.